We’re all familiar with the idea of a kitchen garden – an outdoor space, whether your own garden or an allotment, dedicated to growing food to eat – but there is a growing trend (literally) for garden kitchens – dedicating areas of your kitchen space to growing edible and decorative plants. Growing a few pots of herbs on the window sill has been popular for quite a while but a true garden kitchen is very much an integral designed-in part of the overall kitchen design. There is a growing demand for bringing the outside in and merging kitchen and garden together. This is great if you don’t have an outside space or can create more of a transitional area between the house and the garden. Whether growing plants for food or for decoration (or, of course, both!) there are proven health benefits for house plants including better air quality (plants absorb the carbon dioxide that we exhale creating better oxidisation of the air), they add more moisture to the air which can help avoid conditions that thrive in dry air such as dry skin, sore throats, colds and coughs plus studies have shown that the presence of living plants in the workplace can create more positive, productive environments so it follows the same theory also applies to the home. Herbs, chillis and some vegetables can be gown very successfully in small spaces and being indoors you can grow items that need slightly warmer climates than you can outdoors. Let’s face it, you can’t get fresher than snipping off a few leaves and throwing them straight in the pan can you. The decorative element is certainly central to this trend. How it looks in relation to the rest of the kitchen is just as important as the functional side of indoor gardening. 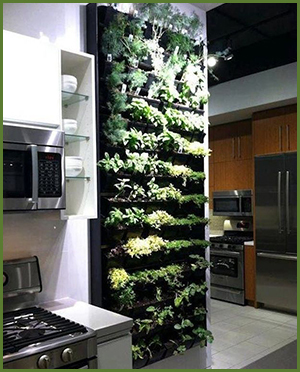 We’ve created a Garden Kitchen Pinterest board that has a range of ideas that you can incorporate into your kitchen – from small indoor terrariums and herb gardens to vertical gardens occupying entire walls. Here are a few of our favourite ideas but please do pop over to Pinterest to see lots more. This herb garden is truly planned in to the kitchen design and its organic nature contrasts nicely with the clinical steel worktops and splashbacks. This simple wooden unit with offset shelves not only looks great and has room for lots of plants, it creates a semi-barrier to the space behind it while still allowing lots of light to come through. These jars hung from vintage style coat hooks look really effective and are great for kitchens with limited space as you wouldn’t be able to use the window area for anything else without blocking light. The plants themselves will also benefit from the sunlight. These hanging mini terrariums are very pretty and an alternative to edible plants. If you're in the process of having a new kitchen designed then you could certainly incorporate some of these ideas in but if you're not ready for that big a change there are lots of things you can implement into an existing kitchen. If you would like to discuss your kitchen ideas with us please contact us. 0 Responses to "Garden Kitchens "